Donald Trumps kind of justice. Thursday evening, Neil Gorsuch??who occupies a seat on the Supreme Court that Senate Republicans held open for a year until Donald Trump could fill it??cast his first public vote since his ascension to the high Court. 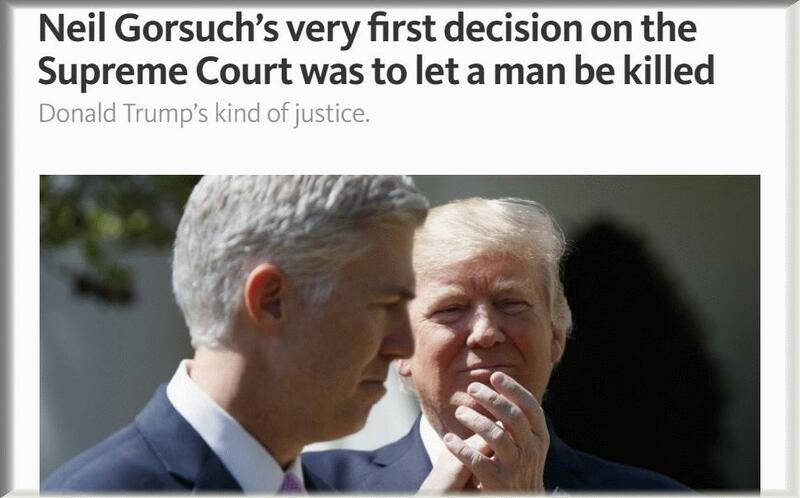 Hours later, a man was killed because of Gorsuchs vote. In recent years, state death chambers have struggled to obtain the drugs they use to execute inmates because many drug companies refuse to sell drugs for this purpose. The Court handed down a series of orders denying relief to some or all of these inmates Thursday night, including a 54 decision in which Gorsuch cast the tie-breaking vote. Shortly after the Court handed down these orders, Arkansas executed Ledell Lee, its first execution since 2005. Lee claimed that he is innocent, and also that his attorney was drunk during his trial. Even setting aside this specific claim by Lee??or, for that matter, the awesome moral and legal questions that weigh upon any decision to kill a human being??there is an entirely bloodless and technical reason why the Courts decision to allow Lees execution to move forward is improper. In its 2015 decision in Glossip v. Gross, a 54 Court effectively held that there must always be a method of execution available to a state, even if that method inflicts great pain upon an inmate. Nevertheless, Glossip at least left open the possibility that an inmate could avoid a needlessly cruel method of execution if they can demonstrate that a different method would be less painful. As Justice Sonia Sotomayor writes in her own dissenting opinion in McGehee, she harbors significant doubts about the wisdom of imposing the perverse requirement that inmates offer alternative methods for their own executions. More significantly, at least as a legal matter, lower appellate have split on how to apply this perverse requirement to individual cases. The Court typically agrees to hear cases when, in the words of its own rules, a United States court of appeals has entered a decision in conflict with the decision of another United States court of appeals on the same important matter, so it is unusual for them to take a pass on this case. It also used to be a common practice for the Supreme Court to grant a stay of execution whenever it agrees to hear a death penalty case??although this practice has faded under Chief Justice John Roberts?? to prevent the case from being declared moot because the inmate at the heart of the case is dead. Under the Courts ordinary procedures, in other words, the justices would have scheduled this case for a later hearing, requested full briefing, and stayed the executions. A majority of them chose instead to allow a man to be killed.